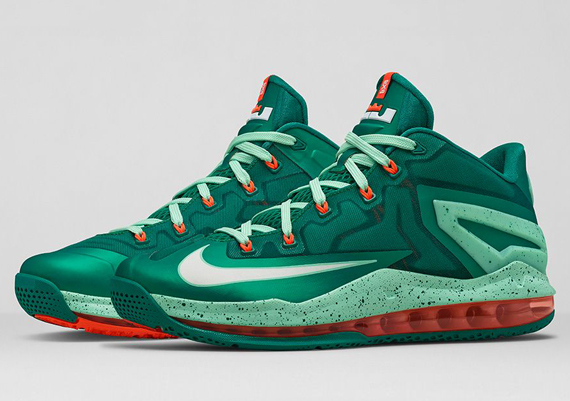 The Nike LeBron 11 Low “Mystic Green” is releasing this Saturday, September 6th, 2014. With the LeBron 12 on the horizon, the pairs of LeBron’s last signature sneaker as a member of the Miami Heat are getting fewer and fewer. This weekend you can settle on this Miami Hurricanes-esque colorway, one that the Swoosh is penning as “Mystic Green” that should bring back some nostalgia for those Cannon 9s that Bron wore during his offseason of redemption while chasing his first ring after a surprising loss to the Mavericks the year prior. As always, you can grab one last look at this LeBron 11 Low pair before they hit retail shelves tomorrow and let us know if you’re an advocate of this latest LBJ release in the comments section.